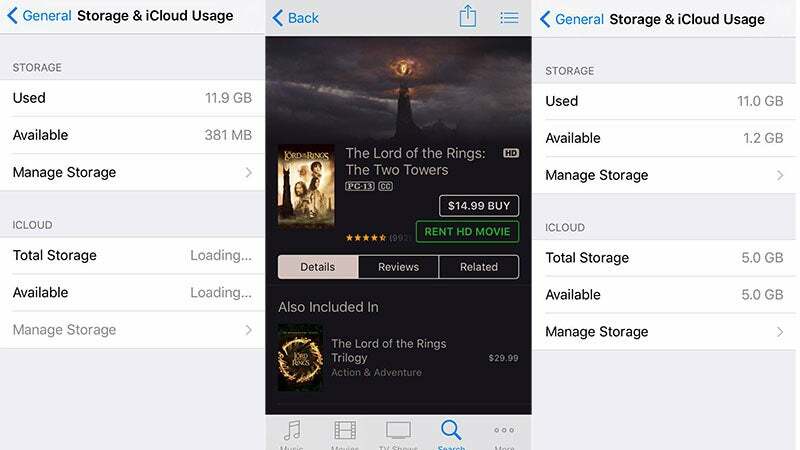 Why Does Lord Of The Rings Clear Up Space On Your iPhone? A Reddit thread is claiming that for those of us — and there are many — who are running out of space on our iPhones, all we have to do is try hiring The Lord of the Rings: The Two Towers. Viola! Free space! An April Fools joke, or so we thought. But I loaded my beat up iPhone 5 with music until it was bursting at the gills and then attempted to hire Peter Jackson's 6.83 gigabyte masterpiece. Lo and behold, I had gained almost 200 megs out of nowhere. Three more rentals and my overstuffed phone had gone from a meagre 381 megs to a full 1.2 gigs of free space. The exploit isn't limited to Tolkien-based fantasy films — any rental attempt where the desired file is larger than your current free space seems to magically create hard drive space. Which begs the question: what on earth is it deleting? And why does it happen incrementally over many failed rentals instead of all at once? We've reached out to Apple for comment, and we've emailed our sincere thanks to Peter Jackson.